Desertification as a global problem affects no less than a quarter of the world land resource and some 250 million of its inhabitants. The Sahelian region of Africa is among the most vulnerable and worst hit regions of the world because of its physical and climatic characteristics coupled with unguided human interaction with the environment. Several efforts are made by the Governments and peoples of the affected countries as well as the international agencies in containing the problem. 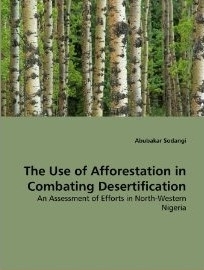 In this study the efficacy of the afforestation approach to fighting desertification in the Sudano-Sahelian region of North-western Nigeria is assessed with the aid of various remote sensing techniques.